We took this question to the In A Pikle streets and we ended up with a myriad of 21st century answers. Whether you’re shopping for fathers, dads, daddys, stepdads, father-in-law’s, padres, papas, brothers, husbands, sons, or brother-in-laws (whew! )… the choices (from hammocks to home delivered ham) available are quite expansive indeed! Our team put together a list of top Father’s Day Finds that are sure to please their fellas this Father’s Day. Writing this blog post gave me time to chuckle as I reflected back to my own childhood….attempting to find the PERFECT Father’s Day gift for my own dad. When I was really young, this was SO easy. A handmade coupon for homemade chocolate chip cookies (only with SEMI-SWEET chocolate chips of course) and a five-minute foot rub (that he would try to push to 10 minutes) WAS the perfect Father’s Day find. As I ventured into my more “independent” youth, purchasing a gift for my dad (with my hard-earned money) seemed to be the way to go. It was then that I realized my dad was THE hardest person to “purchase” a gift for. He was a general contractor and was the most resourceful person I knew. He could fix and / or build anything (and I mean anything.) As the most resourceful man I knew, this also meant that he also had pretty much everything that I could afford to buy him. So… I went back to the gift I knew was a winner… the trusted homemade chocolate chip cookies and foot massage coupon. Over the years, I have purchased my dad a myriad of many things. From gadgets and gizmos to some really useful things (and yes, that included some infomercial one hit wonders to boot!). Each year, I methodically look for the PERFECT Father’s Day Find for the man I am blessed to call my Father. And…this year is no exception. It’s been so fun to venture through the list of “finds” from our team and it definitely got my wheels turning with new ideas. 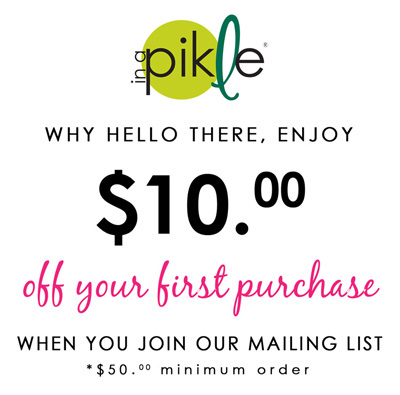 After reflection of my handmade coupon days, this year I’m pretty sure that my dad will be receiving something a bit more nostalgic and it may just be wrapped in our newest little gem (the Gherkin Petite Pikle). Oh, I’d love to be a fly on the wall to watch him open it! This entry was posted in In A Pikle and tagged acenstry, camping, chocolate, country ham, coupon, dad, father's day, flashlight, foodie, gift, hammock, in-law, lululemon, new york times birthday book, nomatic wallet, outdoor, peregrine, rocks, wallet insert.